Now that the holidays are over we are starting the new year with few big news. As some of you might know we were working on Creatus Pro plugin and free version of Creatus WordPress Theme. The hard work is done and over the next few days we will be releasing couple of updates starting with Thz Core 1.1.17 which is a prep for Creatus 1.5.0 update. With upcoming updates we will also refresh our own website. Themezly update will give you all the information about our new products and their features. Creatus Pro plugin is extended version of free Creatus WordPress theme and comes with advanced features and options that will help you build your WordPress based websites. The plugin also contains premium demos and templates. In the near future we will be adding elements and demos for third party WordPress page builders starting with Elementor. I am already using Creatus, what now? Once Creatus Pro is released you will be able to download it for free from our members download area. After the plugin installation you will be able to update Creatus theme to latest version and just continue to use both. You will not notice any difference and can kick back and enjoy your membership at Themezly. What is in free version of Creatus WordPress Theme? 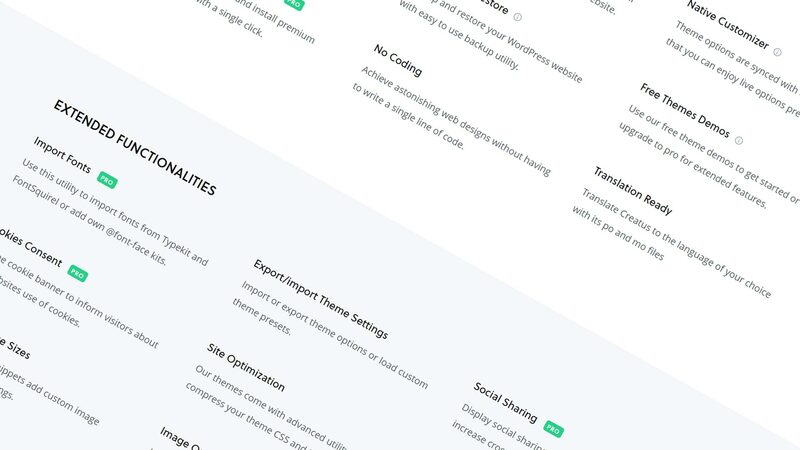 The free version of Creatus includes drag and drop page builder, free page builder elements, theme options panel and customizer theme options. Let’s not forget the free Creatus based demos and free templates library templates. With this version of Creatus you will be able to create fully functional WordPress website. In case you need more power, just get Creatus Pro. Now that you are up to speed we don’t want to take up any more of your time. Just keep an eye on the updates. For more details and friendly discussions consider joining our Facebook community. Themezly is innovative digital agency focusing on WordPress themes and plugins development.